So, what is afternoon tea? According to afternoontea.co.uk it is a tea-related ritual, introduced in Britain in the early 1840’s. 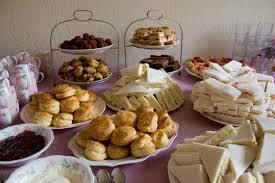 It composed of sandwiches (cut in to ‘fingers’), scones with clotted cream and jam and sweet pastries and cakes. (Although in actual fact scones didn’t start out as part of a traditional afternoon tea, they came along in the 20th century). Afternoon tea was basically something to fill the gap between breakfast and dinner, as more often dinner would be served later in the evening in well-to-do households. It started in the home and was more of a ladies social occasion and soon became a social event within hotels and then elegant cafe’s. In fact, this tradition carried on until the 1970’s when cafes started becoming self-service and hotels started to find other ways to tempt customers. Luckily for us, the 1990’s saw a renewed interest in afternoon teas with tea shops and little cafe’s offering the traditional afternoon tea to all. And it’s really caught on. In the UK at least, it’s a blooming trade. High tea? Is it the same thing? High tea came about from the industrial areas of the UK and was what the working classes called their evening meal. With money tight – and tea expensive – the working classes couldn’t afford to waste their precious tea. So, they would have it with their evening meal and this would be as soon as the worker (more often than not, the man of the house) got home. It typically included a mug of tea, bread, vegetables, cheese and sometimes meat. It’s suggested that the ‘high’ part of the name came from the table it was eaten at. As people sat at their dining table to eat it. Whereas afternoon tea was taken sitting in comfy chairs or sofas at low tables. Funnily enough, the upper classes took high tea too – this was the tea they had when the servants weren’t around to cook them dinner. Something they found easy to prepare themselves. So it would be the same as the working class high tea but with the added ‘posh’ bits of pigeon, veal, salmon and fruit. Oh it’s all so Downton Abbey isn’t it? Which explains why 10 Scotts (and others) include bread and cheese and meat in its afternoon tea. Really, it’s just a mix up of terms and types of meal. But hey, we’re not complaining right? And a cream tea? Well, that’s just the cup of tea with a scone, cream and jam. Popular in Devon and Cornwall; but only due to the cream used, not the tea taken. Get it? And so what about the staple part of any afternoon/high/cream tea nowadays? The stately scone. On our first outing the Teabag and Handbag Ladies had a debate on the correct way to say this word. The Scots amongst us were adamant it was scon, the English said as there’s an e with the o the ‘oh’ sound is produced, and therefore it’s scown. The American just laughed and said “you lot are so weird.” She called them biscuits anyways and didn’t care if they had sultanas, cherries or cheese in. Either way, we all agreed it was vital to the tea’s success. Other vital parts of a modern day afternoon tea? The Brits thought sandwiches – of any type – were expected. 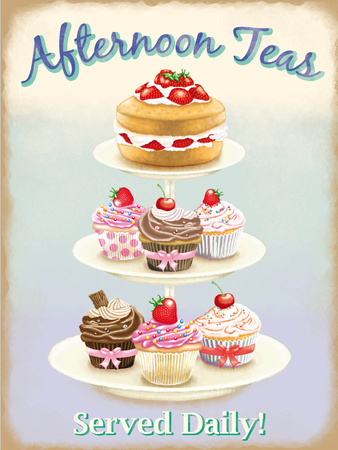 Our Brunei friend agreed – and shared that in Brunei, most families she knew still had afternoon tea daily. We all oohed and aahed at this. Dainty pastries and cakes should be included we felt. These can be anything from a dainty custard tart, finger of carrot cake or tiny apple pie to a modern cheesecake or funky pie that’s unique to a venue. As long as it’s delicate and can be popped in to the mouth, then it’s worthy of an afternoon tea tryout. The tea. Well, there has to be options. Teabag and Handbag Ladies like English Breakfast, Early Grey, Jasmine, Green and Mint tea. And we’re open to trying more. Some of us are really risqué and have a latte – we’re so avant-garde! The ambience, china used, type of cake stand, teapot (drippers and dribblers are a definite no-no) and extras offered all add to the experience. Each place has their own take on the afternoon tea and that’s great. But keep the basics there and you can’t go far wrong. Or can you? Whatever your preference though, there’s an afternoon tea out there for you. You’ve just got to try a few to find out what you really like. That’s what the Teabag and Handbag Ladies are about. Give it a go. Once you’ve tried one though, do let me know.